Kansas’ prettiest duck is also one of America’s greatest conservation success stories. By the early 1900s wood duck numbers were so low it was feared the species might go extinct. For decades the birds had been slaughtered by market hunters, both for their vibrant feathers and their meat. They’d also lost most of their nesting habitat, which was cavities in large trees near water due to heavy deforestation. But with the advent of modern wildlife management, the birds began their comeback. Strict rules on harvesting wood ducks were implemented. Ducks Unlimited and other conservation groups also began promoting the building of wooden nesting boxes and placing them beside streams. In many areas forests have also recovered enough to again support nesting wood ducks. Wood ducks nest in a line from central Kansas eastward in the U.S. and some parts of Canada. Probably every flowing stream or lake in wooded areas of Kansas now hold nesting wood ducks. Birds nesting in areas north of Kansas often migrate through in the spring and fall. 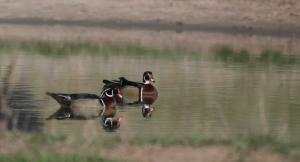 Once considered rare in the western half of the state, wood ducks are becoming increasingly common.